Data with missing values are represented as incomplete information systems in rough sets approaches. There are two possible interpretations of missing values as “do not care” or “lost” values. Many existing works considered only the former case. The use of characteristic sets to deal with both cases was first introduced by Grzymala-Busse. 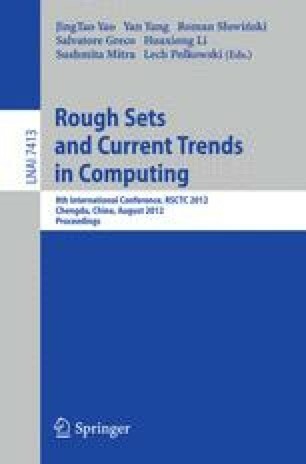 In this paper, we introduce a refinement of characteristic set approach to incomplete information systems, and we show that it can improve approximation accuracy similar to the improvement obtained by applying the techniques of maximal consistent blocks and binary neighborhood systems approaches to dealing with “do not care” missing values. Additionally, subset and concept based approximations are introduced for binary neighborhood systems in order to preserve upper approximations.